crankiness in a different light is something we gravitate towards! Pout-Pout Fish is always frowning as he swims around the ocean. He frowns when he encounters his fellow ocean-dwellers, who all try to cheer him up to no avail. Will Pout-Pout Fish ever learn to smile? This book is a great read-aloud choice! Kids will love the refrain “I’m a pout-pout fish / With a pout-pout face, / So I spread the dreary-wearies / All over the place.” This creates a call and response for storytime, with “Blub, Bluuub, Bluuuuuuub” following right behind the catchy verse. 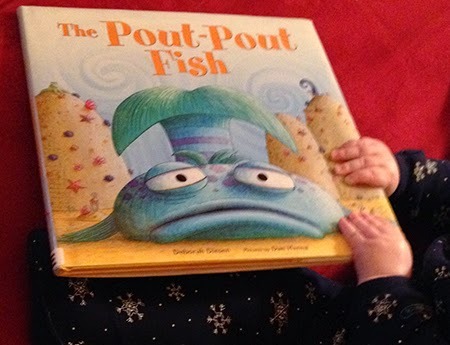 My seven-month-old even learned the rhythm of the words and would lean back to watch me blue along with Pout-Pout Fish! The illustrations are absolutely gorgeous; the jellyfish page took my breath away! The images are bright and vividly colored, sure to draw in young readers. One ocean friend is introduced per page spread, but there’s an added game of looking for and identifying all of the other critters that inhabit the pages. There is a whole series of Pout-Pout Fish books - with more still coming out! This first one is so enjoyable, I know we’re going to read and love them all.